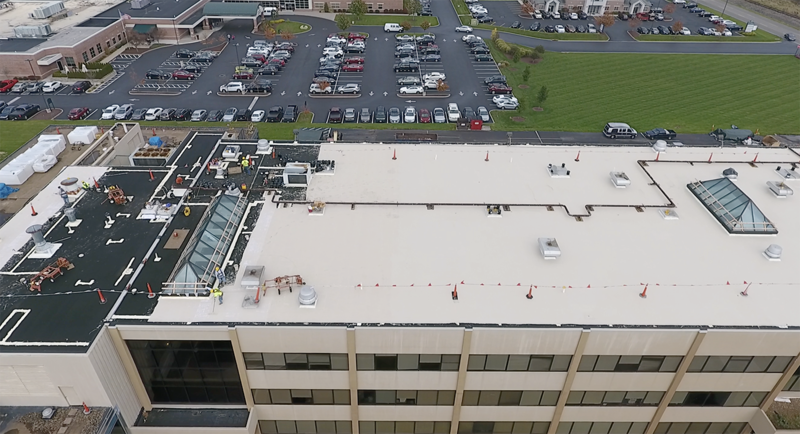 On a 45 mil roof membrane, how much waterproofing protection do you think you get? Wait, you mean it’s not 45 mils? First it needs to be determined whether the membrane was “laminated” or “saturated.” Common among single-ply systems, a membrane consists of a bottom layer, a polyester matting or scrim in the middle, and then another layer on top, which are all laminated together by a machine in a factory, to make a single sheet. When the membrane is laminated, the top waterproofing layer above the scrim (or middle polyester layer) becomes very important. What does this mean? NRCA studies tell us that single-ply roofs wear an average of 1-2 mils per year. So if you only have 15 mils above the scrim, you can expect the top waterproofing to be worn halfway – or more – to the scrim in just 10 years. It’s our position that once you get to the scrim you’re in failure mode. You’re much more vulnerable to leaks because at that point, you’ve lost most of the waterproofing protection. Laminated sheets are prone to peeling, and one puncture through the top sheet can compromise that section of roof because it exposes the scrim. With a saturation technique, you have the same, continuous consistency of waterproofing throughout the entire membrane. Metaphorically, consider lamination as a pressed wood desk with a protective sheet as the top layer; while saturation is more like a solid wood that, even when chipped or scratched, still maintains its strength and integrity all the way through. When we’re restoring roofs we’re essentially manufacturing a custom membrane directly to the surface of the existing roof. Our 10-year system, for instance, starts with a base layer of liquid Wite Brite™. From there, polyester matting is rolled right into the Wite Brite™ waterproofing while it’s still wet, thus saturating into the scrim from the bottom. Next, we apply two additional layers of Wite Brite™ above the scrim, each one saturating down from the top. In the end, we’ll have a fully saturated system that offers reinforced waterproofing protection without thin layers. Even further, the system is installed above the existing roof, allowing you to maintain any remaining useful life that’s left in the existing roof. Not only does a saturated membrane enable all its mils of waterproofing to truly and practically work for you, but internal tests have documented a wear rate that’s much slower than NRCA’s data on TPO membrane wearing. For more information about saturated membranes, visit roof replacement alternatives.